After a break of almost 48 minutes, Rihanna has come back with a new single from her seventh (SEVENTH!) album. 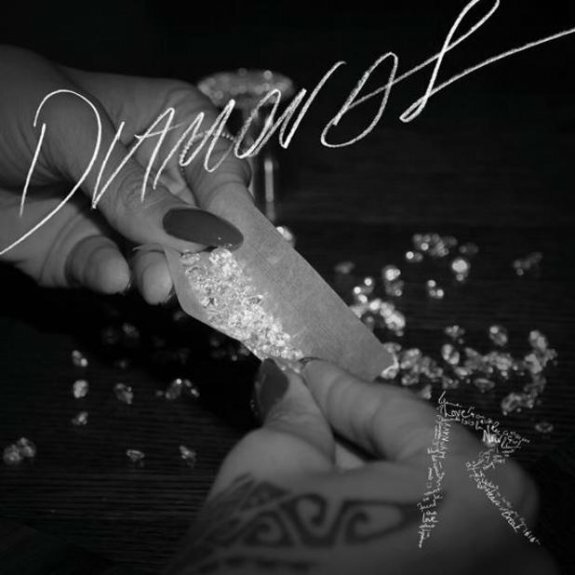 Diamonds was written by Sia and Rihanna, and production duties come from Stargate and Benny Benassi. A bit of a slow-burner after all the stompy stompy business on Talk That Talk, Diamonds is basically a power ballad in a party frock: A piano-led, midtempo love song set to the muted thud of a kick drum. "You and I are beautiful like diamonds in the sky," sings Ms Fenty, in one of her best vocal performances to date. You can listen to a radio rip below. Or, if that disappears, the hi-quality version is available to stream on Rihanna's Soundcloud page. So that's very good and all - but where does this single rank in the all-time top five of singles with Diamonds in the title? Allow me to illustrate. 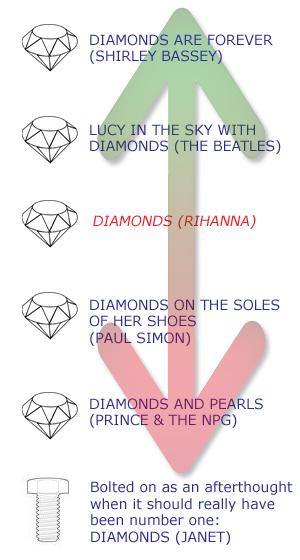 PS: You can download a poster of the lyrics to Diamonds on Rihanna's new website - Rihanna7.com.